Hope you’ve been enjoying them so far. While we’re almost through the season, there is still one more big bash to go, and it’s all about the bubbly. 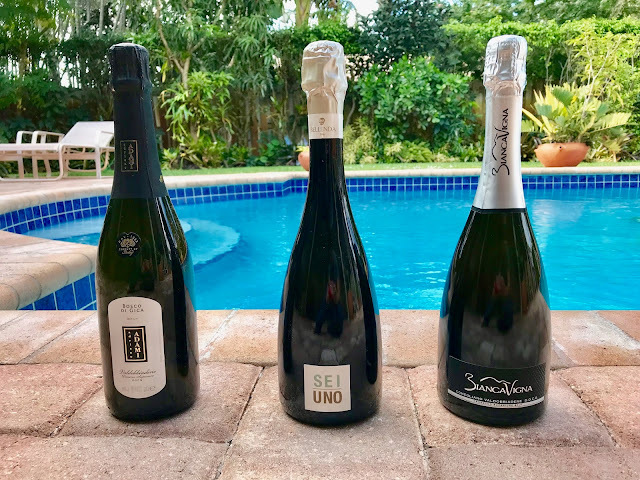 I recently had a set of Prosecco samples sent to me, which I enjoyed with the fam in Florida over Christmas week. These wines accompanied three evenings of very happy festivities. I thought I’d share them with you here as inspiration for the NYE celebrations to come tomorrow night! All three Proseccos were really lovely. All three of these were Brut versions and quite dry–much more so than the average version you’re likely to find. They still had the bright, fruity quality that Prosecco is known for, but with a really crisp finish. Before we move onto the wines though, let’s cover a few of the Prosecco basics. Typical Production Method: Tank method (aka Charmat/ Italian Method/ Martinotti Method. The second fermentation occurs in a sealed tank rather than in a bottle, as is the case in méthode traditionnelle, wines like Champagne. A dry based wine is mixed with sugar and yeast in a tank to get a second fermentation going, which creates the bubbles. Sediment is then removed and the wine is bottled under pressure. This method is particularly good for preserving bright fruit flavors in wines, which really suits certain grapes like Riesling or Glera. Prosecco comes in many sweetness levels. 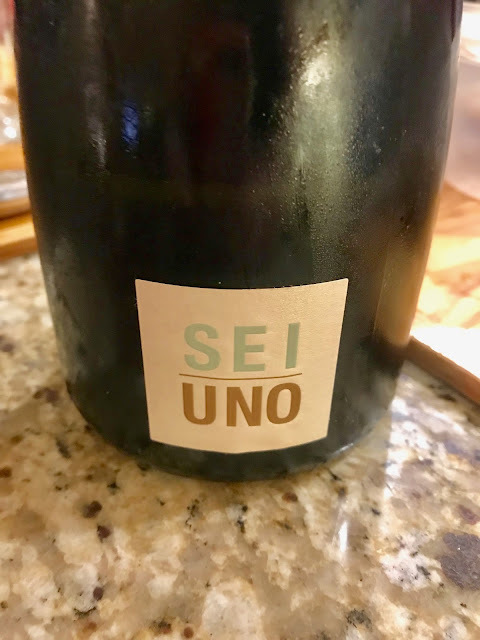 Extra Dry (with residual sugar of 12–17 g/l) and Dry (17–32 g/l) versions are more common, but Brut versions do exist - including all three of today’s wines. Prosecco also comes at various quality levels. There are plenty of solid grocery store versions for easy drinking. However, if you’re looking to move up the quality ladder, there are some easy guidelines to look for. First, look for the letters DOCG on the label or on the neck of the bottle, as opposed to DOC. (Denominazione di Origine Controllata e Garantita, versus Denominazione di Origine Controllata—this indicates a step up in Italy’s quality designations.) Prosecco from the DOCG zone comes from more select vineyard sites with greater regulation and control on production. “Superiore” indicates another step up in quality–these wines come from 15 specific communes. In addition, there are a few names you can look for. Superior versions come from Conegliano-Valdobbiadene DOCG . In addition, Cartizze, is an even more specific area from the Caritzze hill. You might also see Rive + a village name. These are communes that have earned the right to put their names on the bottle if the meet certain production requirements. All of today’s wines come from the DOCG zone. Moreover, moving up the quality ladder doesn’t have to cost much. None of today’s examples will break the bank. Now let’s get to the food and fun. Al, an old friend of the family came over to my parents house came a couple of days before Christmas. After an afternoon of chatting, eating, and drinking, the fun spilled over into the evening and turned into an impromptu dinner party. 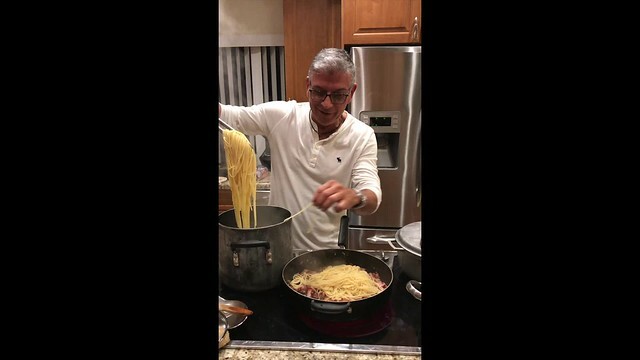 Al decided to whip up a batch of Pasta Carbonara. 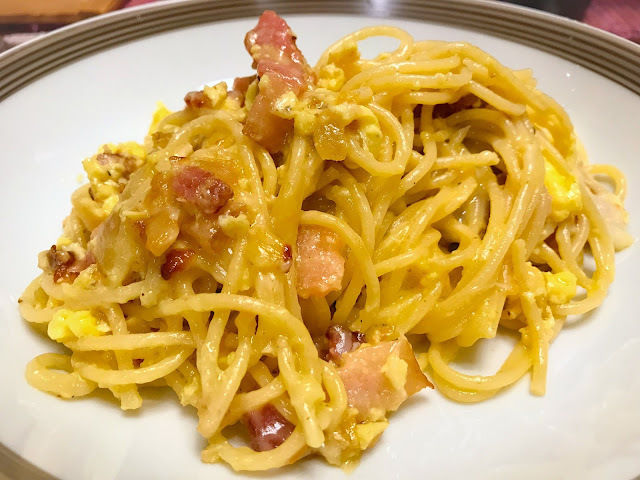 I always think of Carbonara as a decadent grown-up version of mac and cheese with its mix of pancetta or bacon, Parmesan cheese, and silky eggs. 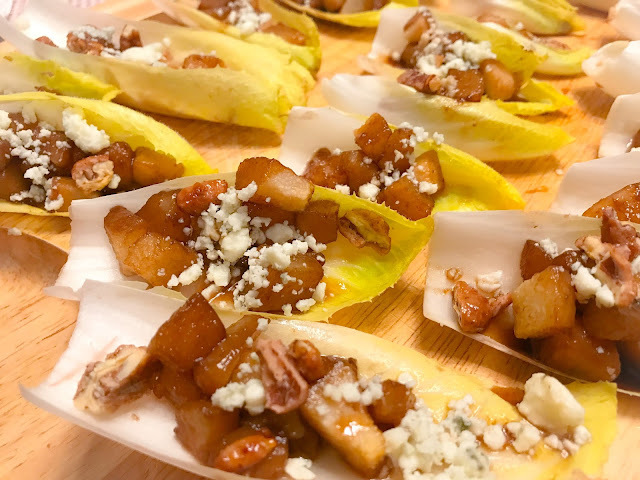 It feels special and elegant enough for a celebration, and yet it comes together quickly and there’s a good chance that you already have everything you need in the fridge and pantry–perfect for when parties just suddenly happen! His version was a pretty classic version (much like this one) with the small twist that he started by sweating some onions in the pan. Once you have everything together, this pasta comes together really quickly. I happened to get a get a video of the cooking–Enjoy! 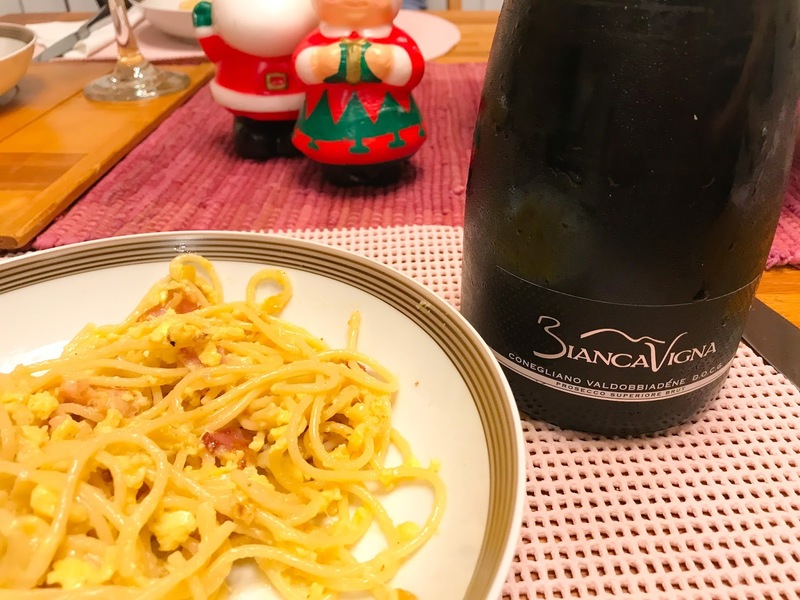 The BiancaVigna was delicious with the pasta. This wine comes from a sister and brother winemaking team making, Elena and Enrico Moschetta. They own (30 hectares of vineyards, along with Elena’s husband) in Conegliano Valdobbiadene. The wine had fruity notes of bright green apples and pears with a refreshing, crisp finish. The fruity factor worked really well the saltiness of the bacon, and the effervescence invigorated the palate after every creamy bite of pasta. Really loved this combo! Greg and I enjoyed the Bellenda Sei Uno Prosecco pretty simply–we sipped it while snacking and catching up with friends. Two of my nearest and dearest actually, from very different parts of my life–Lu, my childhood bestie, and Anto, my sista-from-another-mista from my high school years in Venezuela. I rarely get these to hangout with these ladies at the same time. Also entertaining us at the table was Artie, the Will to Lu’s Grace. Such a pleasure to have this crew together. We enjoyed several bottles amongst the group of us and among them was this bottle. It turned out to be a big crowd pleaser! This one was really lively with lots of bright citrus, Anjou pear, blanched almonds, and a lot stony minerality–even a little salinity. It turns out that this Prosecco is actually made via the méthode traditionnelle with the second fermentation occurring in the bottle , rather than the tank method that is more typical of Prosecco. It then spent 6 months on the lees. This explains that touch of almond flavor. The Bellenda winery was started by the Cosmo family in 1986. Since then they’ve redesigned the vineyards and have moved towards greater environmental practices and sustainability. Like I said, the group really enjoyed this. 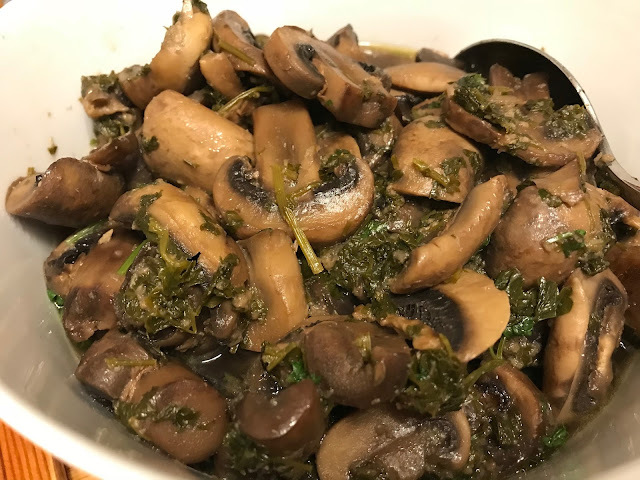 It was lovely on its own, as well as with cheese and other snacks; however, several of us were left with a craving for Linguine alle Vongole. This wine would be perfect! I’ve been studying and working in wine for several years now. Somehow, in all this time, I’ve never sabered and bottle of bubbly . . . until now. I helped to kick off our family festivities this year with a little drama by sabering a bottle of Prosecco. Moving on to the food now. The centerpiece of the Venezuelan Christmas table is the Pernil–a pork roast of the leg or shoulder. 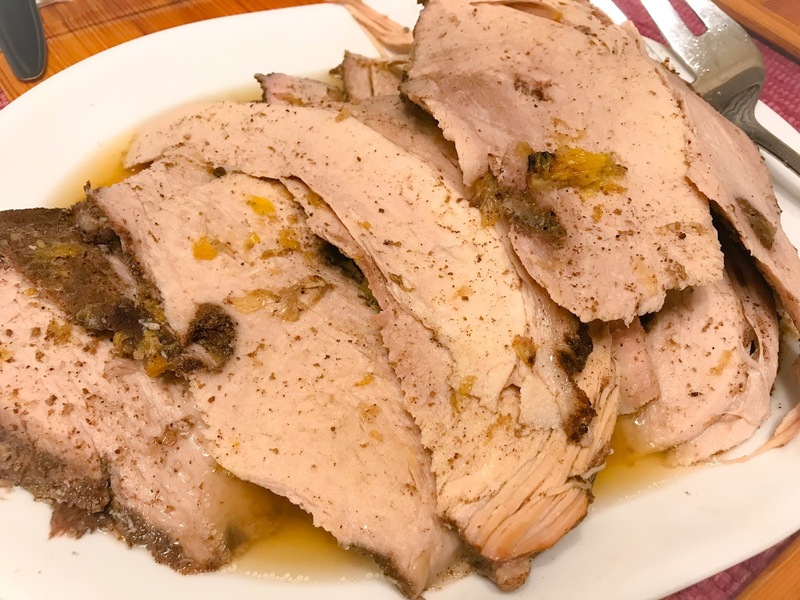 (Pernil is also common to Puerto Rico, Dominican Republic, and Cuba.) My mom’s rocks. 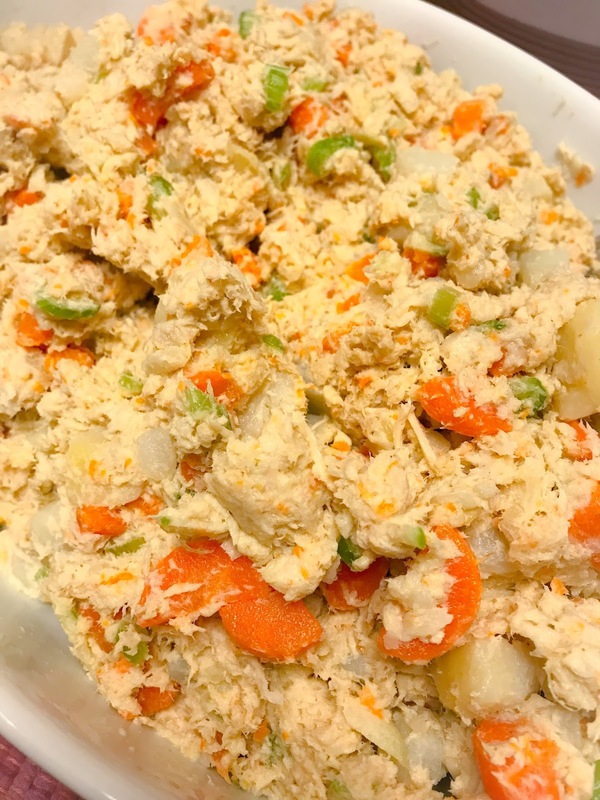 I don’t say this just because I’m her daughter; it’s pretty universally touted by those lucky enough to have tried it to be a particularly flavorful example. (This is especially impressive as she doesn’t really eat meat.) It’s marinated in all kinds of delicious spices like cumin, tons of garlic, and allspice. Someday I’ll get around to sharing her recipe, but in the meantime here is a simplified Cuban version from Saveur. 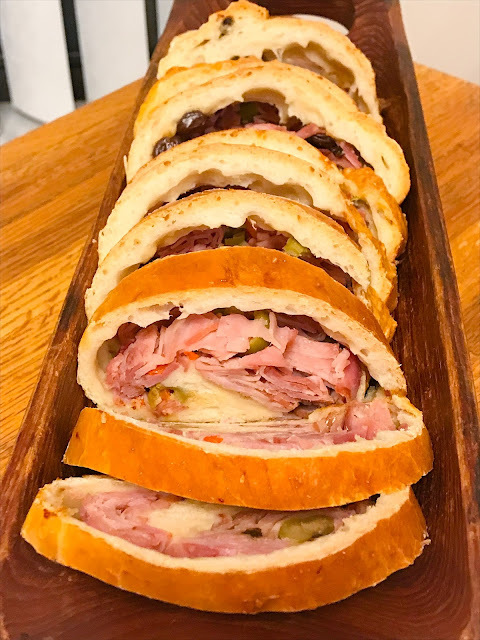 In addition, there are always a couple loaves of Pan de Jamon (ham bread, here’s a version from The Spruce) to munch on, and Ensalad de Gallina (Venezuelan Chicken Salad–I recenly wrote up a simplified version on WineSpectator.com). 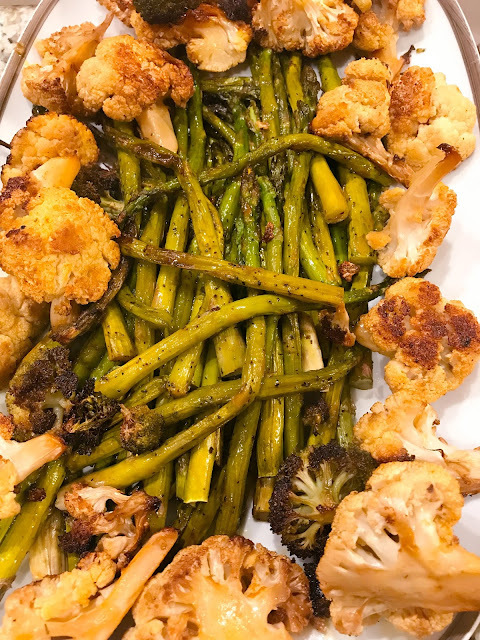 We were trying to keep things (slightly) lighter this year, so we also had quite a few veggies–roasted cauliflower, asparagus and my mom’s sautéed mushrooms. Prosecco turned out to work quite well with it all! 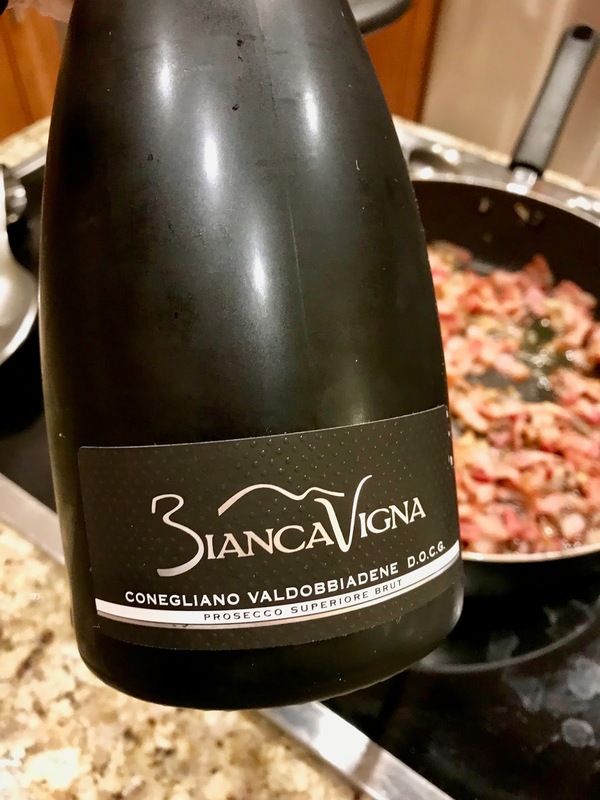 I’m not going to lie, we tend to have salty palates in our family, and just like with the Carbonara, the fruitiness of the wine really played well with the salty/savory notes and the effervescence refreshed the palate, keeping it all from getting too heavy. 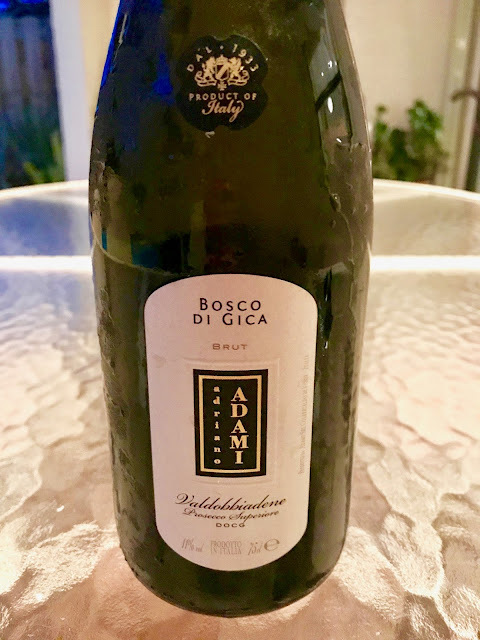 On this evening, we had the Adami Bosco di Gica Prosecco Superiore NV among the wines we had with dinner. This one had more rounded fruit notes with white peaches, gold apples, ripe citrus, which then finished clean and refreshing. The winery has been in the Adami family since 1920 and is now its third generation. "Bosco di Gica" is the ancient name of the family's first vineyard–the site dates back to 1490. The vineyards are located 100-300 meters above sea level, with t steep, south-facing slopes. Prior to the actual feast. I also made a super simple appetizer with Prosecco in mind. It turned out delicious if I do say so! 2. Combine the diced pears, the balsamic vinegar, the sugar, and pinch of salt in a small oven-safe dish. Place in the oven for about 30 minutes, or until the pears are tender but toothsome. Remove from the oven and allow to cool. 3. Optional–Separate the balsamic mixture from the pears and pour in a small saucepan. Reduce over medium heat until the vinegar reaches a more syrupy consistency. Remove from heat and set aside. 4. Set up an assembly line of all the components. 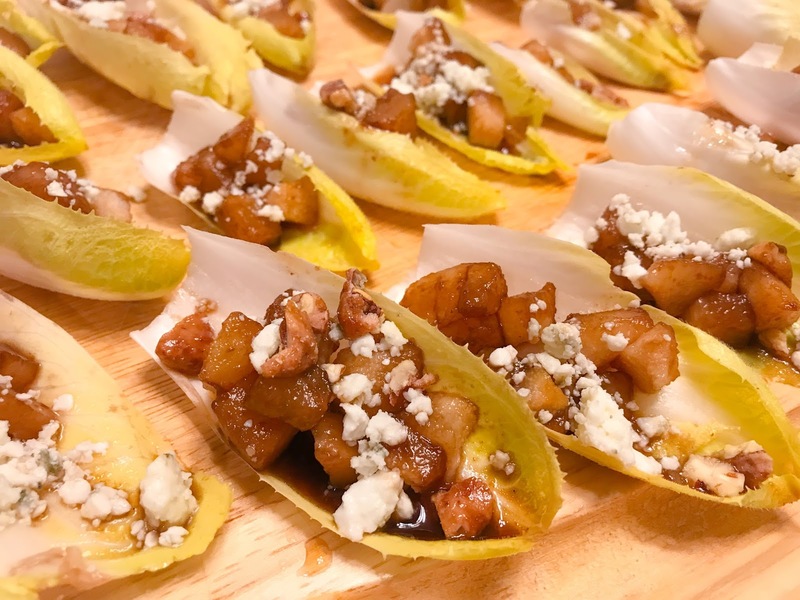 Spoon a small scoop of pears onto each leaf, followed by a drizzle of vinegar, topped with a some blue cheese crumbles and some candied nut pieces. 5. Arrange the spears on a platter and serve.